– curso reconhecido em 97 paises !! 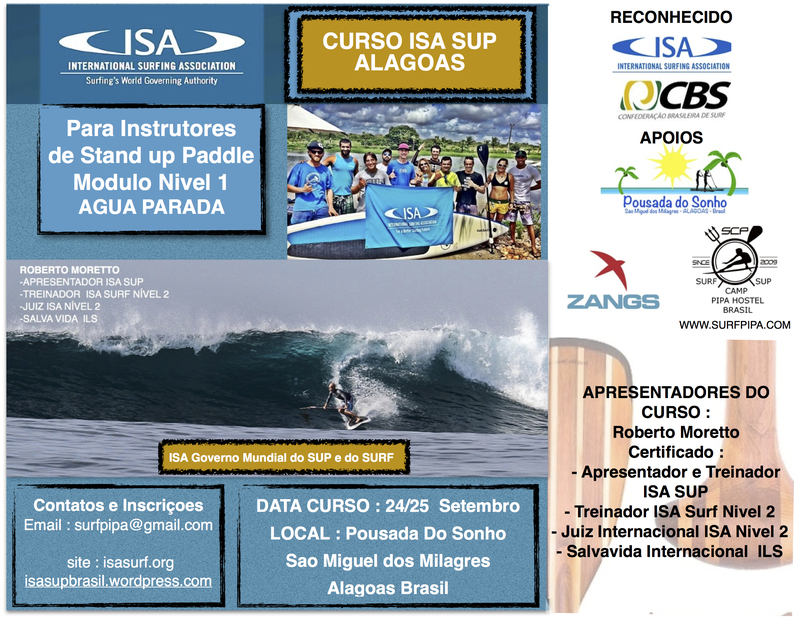 A Associação Internacional de Surf (ISA) é reconhecida pelo Comitê Olímpico Internacional (IOC) como a competente Autoridade Mundial para o Surf, o StandUp Paddle (SUP) e todas as outras atividades relacionadas. A ISA está coroando os Campeões do Mundo desde 1964. 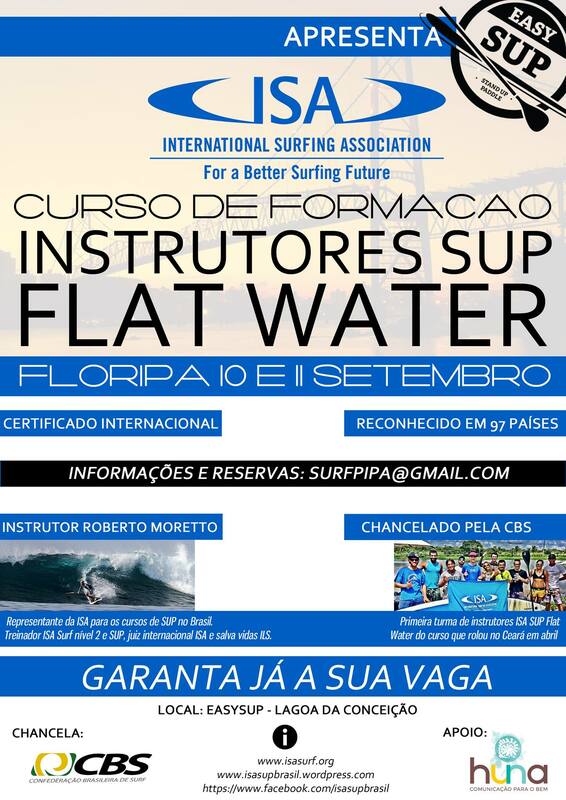 O Programa Educacional ISA de Instrução e Treinamento para surf e sup é o padrão internacional para o credenciamento de treinadores e instrutores na indústria das escolas de surf. programa progressivo de formação de instrutores. Instrutores de crianças, adultos, veteranos, pessoas com deficiência ou atletas de elite, clubes, escolas, a nível regional, estadual ou nacional, podem se tornar educadores mais eficazes participando do CIP. Desenvolver ainda mais, através de programas educativos, um corpo de conhecimento em que treinadores e instrutores possam atualizar-se. Fornecer a treinadores e instrutores oportunidades de emprego, incentivo e apoio. La Jolla, California, November 12, 2014 – The International Surfing Association (ISA) is proud to announce that the 2015 ISA World StandUp Paddle and Paddleboard Championship(WSUPPC) will be held in Sayulita, Mexico from May 10th to the 17th. This event will mark the first ever ISA World Championship to take place in the country. The ISA WSUPPC has witnessed explosive growth since the inaugural event in 2012. It has nearly tripled in athlete participation from 105 to 277 and grown from 17 to 27 countries in its first three editions in all divisions. Mexico offers a rich coastline with many incredible destinations for StandUp Paddle (SUP) Racing and Surfing, and Sayulita is a perfect location to host the ISA WSUPPC. Sayulita is considered the epicenter of Mexico’s SUP community. La Jolla, California, 12 de Noviembre de 2014 – La International Surfing Association (ISA) se enorgullece de anunciar que el ISA World StandUp Paddle and Paddleboard Championship (WSUPPC) 2015 se llevará a cabo en Sayulita, México, del 10 al 17 de Mayo. Este evento será el primer Campeonato Mundial de la ISA en este país. El ISA WSUPPC ha sido testigo de un crecimiento explosivo desde el evento inagural en 2012. La participación de atletas se ha casi triplicado, de 105 a 277 y crecido de 17 a 27 países en todas las divisiones, durante las tres primeras ediciones. México ofrece una hermosa línea costera con diversos destinos increíbles para el Surfing y Carreras de StandUp Paddle, y Sayulita es el lugar perfecto para acoger el ISA WSUPPC, al ser considerado el centro de la comunidad de SUP de México. 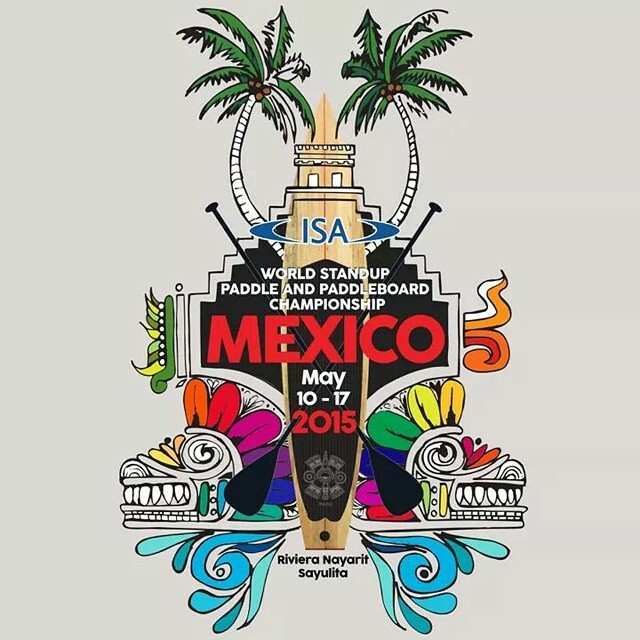 “Estamos encantados con que México acoja el World StandUp Paddle and Paddleboard Championship 2015 en Sayulita, el cual será el primer Campeonato Mundial de la ISA en México” dijo el Presidente de la ISA Fernando Aguerre. “Sayulita será el lugar ideal para los mejores Surfistas SUP, Corredores de SUP y Paddleboarders del mundo, donde se reunirán para competir por el Oro. Estamos agradecidos por la dedicación y los esfuerzos del presidente de la Federación Mexicana de Surfing, Luis Skeen y su director de SUP, Alfredo Salamanca, por hacer posible este evento. Deseamos que se convierta en una relación de largo plazo entre la ISA y México”. The History Of Stand Up Paddle Boarding Starts With Our Genetic Code As animals go, we humans are the oddities in our jungle. Unlike most, we are designed to stand up and travel great distances on just two legs. Though our evolution is the subject of great debate, all human babies are born with an innate drive to stand up. Offer your index fingers to the hands of a tiny seated infant and the baby will grip hard, using your offered fingers to immediately push themselves upright on to their wobbly little feet. A human baby will progress from standing alone to walking and eventually running, usually by the second year of life. Stand up paddling gives us humans an amazingly efficient way to travel quickly across a body of water in our naturally favored position. 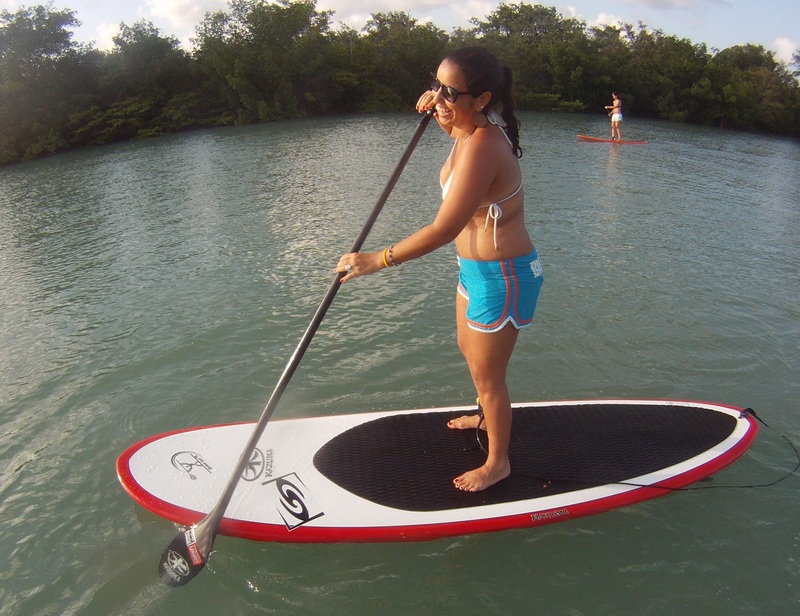 Think about how excited and intrigued you were the first time you saw someone stand up paddling. Tap into your nomadic ancestry and you’ll understand how valuable it would have been for hunting and the discovery of safe, more verdant shores. It has a universal appeal. As humans, we are naturally inclined to move forward. We advance with our eyes first, scanning the horizon, arms helping to propel our bodies, all while effortlessly balancing on two feet. Modern stand up paddling is inherently recognized as a valuable skill by our inner prehistoric selves. Ancient Fisherman Lay the Groundwork caballitos de totora Standing up to fish and for transportFishermen all over the world have been standing solo in their small vessels for thousands of years. Chan Chan is ground zero of a rich and ancient Peruvian civilization. Bordered by fertile lands and an ocean that teemed with life, Chan Chan was once the largest city in South America. On its shore near the village of Huanchaco is a coveted surfing beach where caballitos de totora which translates to “little horses made of reed” are straddled and then surfed by the local fishermen. To aid in maneuvering the vessels into the waves, a split and hollowed length of bamboo serves as a double ended paddle. 3,000 year old shards of painted pottery depict the unchanged design of these same famously photogenic reed boats. It’s not hard to imagine young, virile fishermen showing off to their peers and potential mates by standing on a caballito and skillfully paddle surfing it to shore! Amazingly, caballito is a modern name for these handmade boats that predate the arrival of fifteenth century Spaniards and their horses by thousands of years. Italian GondolaFast forward to seventeenth century Venice, the magnificent Italian city that’s built almost entirely on the water. Eight to ten thousand gondoliers use long paddles to move their vessels through the crowded canals. Today, only about four hundred gondolas remain in service. They shuttle tourists and wedding parties through the beautiful city that remains steeped in mystery, romance and glorious water. The Hawaiians Pioneered Stand Up Paddling For Fun! duke kahanamoku stand up paddlingThe first standup paddle surfers to surf for the sheer joy of flying down the line on a board are believed to be Hawaiian. Ancient Hawaiian islanders survived with nature, not because of nature. They called themselves keiki o ka’aina, literally “children of the land”. The earth provided the islanders not only food and materials to build with, but a place of deep spiritual connection and playful recreation. Aina means “that which feeds”. The land, the sea and mankind were thought of as siblings born to the same parents at the beginning of time. As siblings of the sea, Hawai`ians of all ages and sexes enjoyed playing together in the waves. Maka ‘ainana is a term used to describe the common people, but it actually translates to “eyes of the earth”. Nature nourishes, and by custom, humans were to play with and protect their siblings, the land and the sea. Though Hawaiians have probably been standup paddle surfing for centuries, the earliest photographic evidence is only about 60 years old. Duke Kahanamoku, the most famous of the Waikiki beach boys, was said to use an outrigger paddle to help propel his heavy board into the velvety waves of Waikiki. John Zapotocky Stand up PaddlingTwo other Hawaiians beside Duke are often named as the first. Young John “Zap” Zapotocky, born in 1918 had moved to Oahu from the Mainland in 1940. After a few years of working at Pearl Harbor, the Dole Pineapple Cannery hired him as a machinist. A family man loved for his community involvement, Zap also became a dedicated waterman. There is a full feature on John Zapotocky in our Spring 2011 Issue. He was one of the few non-native Hawaiians to be named as an honorary Beachboy by his surfing brothers. Zap had admired how Duke and a few of the other Beachboys used a paddle to help themselves surf more effectively. In the 1940’s Zap began to include a canoe paddle in his own morning routine of surfing out at Waikiki. He didn’t stop using the paddle as he surfed for the next 60 years. Dorian “Doc” Pascowitz said at John Zapotocky’s memorial on 10/29/13. “Please remember that this, the biggest, greatest development in the sport of wave riding of the last 1,000 years is the result of the passion, the effort and the aloha of John “Zap” Zapotocky.’ John “Pops” Ah Choy was born in 1920 in ‘O’okala on the Big Island, but raised his own family on Oahu. Pops was an inventor, the father of six and one of the others most mentioned as the first to surf with a paddle. Pops constantly tinkered with homemade ideas. He created a board wagon that he (or one of his surfing sons) could use to easily haul 8 heavy boards weighing nearly 100 pounds each, from home to Kuhio beach. He also designed leg leashes, skateboards and a chair with suction cups which allowed him to fish while sitting on his board. As failing knees made it difficult for Pops to pop up on a surfboard, he began to carry a canoe paddle out to help him surf the waves. Standing between sets also greatly improved his vantage as a photographer. Taking photos of tourists was yet another skill Pops used to help feed his large family. Passeio na Lagoa Guaraira com suas águas calmas, é ideal para a pratica do Stand Up Paddle (SUP) e através de noções básicas oferecidas pelo nossos Istrutores , você pode aprender a remar em pé… e descobrir lugares incriveis que só esta região tem a oferecer. 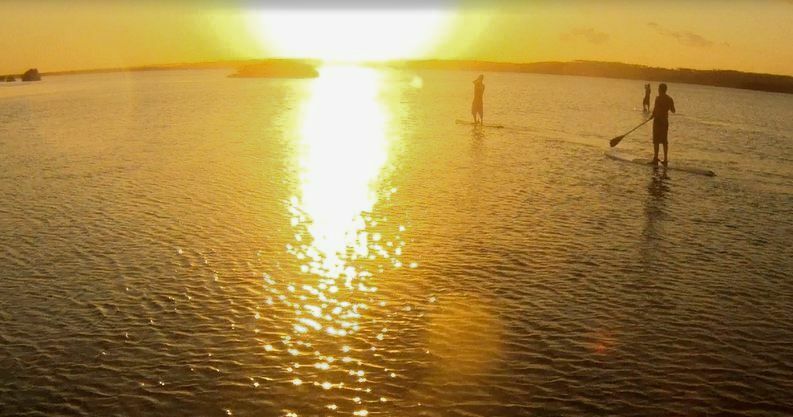 Mais conhecido como SUP, o Stand Up Paddle é um esporte aquático que consiste em remar em pé sob uma prancha. Praticado em águas calmas (lagoas, praias específicas), o esporte havaiano é a sensação do momento no Brasil e serve tanto para passeios, travessias de longa distância e todos os tipos de ondas. O Stand Up Paddle é uma prática saudável que trabalha todos os membros musculares, fortalecendo os músculos e melhorando o condicionamento físico, além de treinar o equilíbrio físico e mental. o aluno irá desenvolver melhor postura e equilíbrio, além de conhecer os equipamentos e aprender as técnicas fundamentais de remada e direcionamento da prancha. A Escola oferece, após o curso básico, aulas avançadas e direcionadas para o surfe com o Stand Up Paddle, e para grandes travessias, além de oferecer suporte para a compra de seu novo equipamento.